Preheat oven to 325° F. Spray an 8x8 baking pan with nonstick cooking spray. Combine Fudge Brownie Mix with water, oil, and eggs as directed on package. Pour into prepared pan and bake for 45-55 minutes, until toothpick inserted 2 inches from side of pan comes out clean. Cool completely then cut brownies down the center of pan. Cut each side into 6 rectangles. Remove brownies and smooth edges to form a log shape. Spoon half a can of Betty Crocker™ Chocolate Frosting into a microwafe-safe bowl and cook for 30 seconds, until melted. Dip each brownie log in the melted frosting and place on wax paper to set. Spoon the rest of the icing into a freezer baggie and snip off one corner of the bag. Pipe out lines and swirls on your brownie logs to make grain. 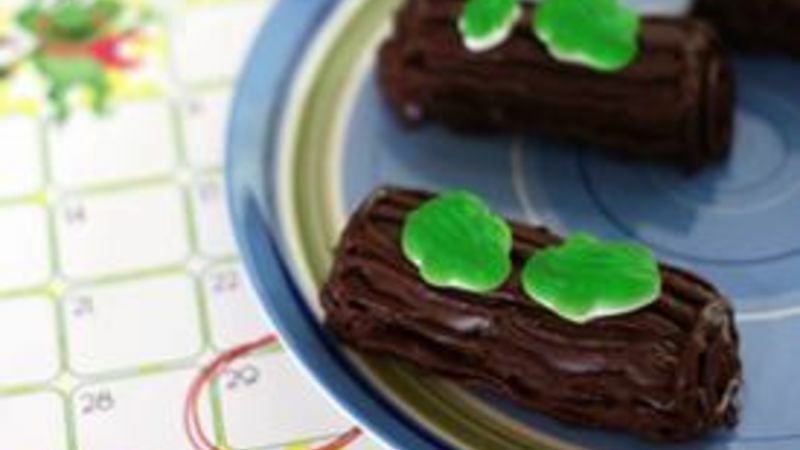 Place desired number of gummy frogs on each log and serve. What better way to celebrate Leap Year than with a fun dessert that will leap right off your serving plate? My oldest daughter is crazy about frogs, so she helped me whip up these easy and adorable Frogs on Logs. Betty Crocker Brownie Mix and Chocolate Icing made these come together in a snap! First, we used a Betty Crocker Fudge Brownie Family Size Mix but baked it in an 8” x 8” pan….we want those brownies nice and thick! When cooled, cut in half, then cut into 12 rectangles. Next, remove brownies and carefully smooth edges so they form a log shape. (At this point I also popped them in the freezer for a few minutes so it would be easier for my daughter to dip them -- but that's not necessary). Then, spoon out half of a can of Betty Crocker Chocolate Icing into a microwave-safe bowl and cook for 30 seconds, until melted…yum! Dip each of your brownie “logs” into the melted chocolate and set on wax paper or parchment. Spoon the remaining icing into a freezer baggie and snip off a corner of the bag. Squeeze out lines and swirls to create wood grain on your logs. Be sure to watch them carefully, these treats have a tendency to leap away! What are you doing with your extra day this Leap Year? Tell us about it!